Oil on canvas, 31 x 39 cm. 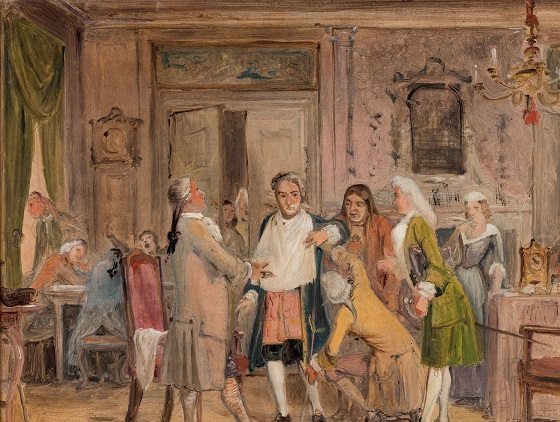 In this sketch, Wilhelm Marstrand has captured the hubbub that constantly surrounds the main character of Ludvig Holberg’s play Den stundesløse. Vielgeschrey is a stressed merchant whose imagined busyness results in him suffering a tragicomic fate. In his eagerness to live life before it is too late, he never really gets to live it. The protagonist’s name alludes to the old German expression “Viel Geschrey und wenig Wolle”, meaning “Much ado about nothing.” Marstrand has illustrated this expression with his dynamic depiction of the Holbergian spectacle. A barber has just applied shaving cream to his face while a tailor takes measurements of his clothes and a peasant tries to con him.